Delivering Delicious from your local roasters to your doorstep! Roasted in the Carolinas. Delivered to your door. We are an online coffee subscription and gift service, providing three new carefully curated roasts from local North Carolina roasters, delivered every month to your door. We work with roasters who love story, the story of where their beans come from and how they’re produced. In this way, we curate the highest quality beans and carefully package them with creativity and love. 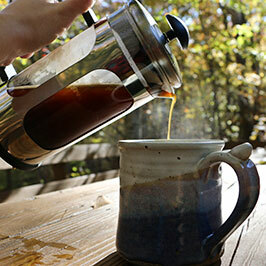 Our roasters use their coffee to wash down cheese grits and ham biscuits. Our coffee doesn't sit on store shelves for months. We select the freshest roasts and deliver the beans straight to your door. 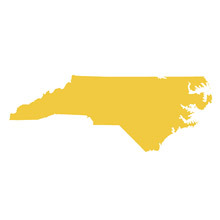 NC’s got a lot of roasters, y’all. We find the best ones and select their best roasts to deliver a new experience every month. Every crate has three 4-oz. bags of whole bean coffee-that's 12-oz. total. New crates are shipped every 15th of the month. 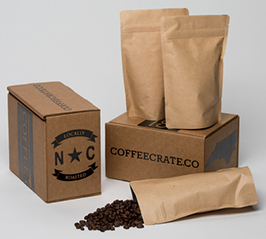 Each crate features three different North Carolina specialty roasters. Roasters' notes and sometimes special treats accompany each crate. Don't worry; shipping is on us. We believe that coffee tastes better when there’s a story that connects us to the origin of the beans and the journey they take from the growers to roasters.